At Proforma, we celebrate the sweet and savory with our very own staff potlucks, cooking competitions, the occasional catered “working” luncheons and more. 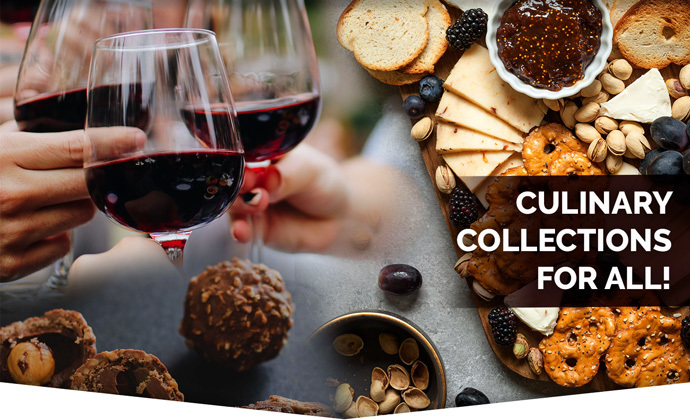 With all of our taste-testing experience, we recommend you kick your gourmet gifts up a notch from fruit baskets or cookie platters and add a special touch to your next networking event or even employee appreciation gift. Not convinced? Keep in mind that by sharing gourmet gifts you are able to create a memorable experience that is sure to make a lasting impression on everyone from clients to employees. At Proforma, we believe gourmet food gifts are a wonderful way to express gratitude, recognize accomplishments or simply create incredible get-togethers! From sweet and savory snacks to sophisticated refreshment accessories, we’re here to recommend the perfect gift! With a sleek and stylish design, the Huntington Stainless Steel Wine Kit will look fabulous on any tabletop or bar, while blending in with any preexisting barware. Double-walled construction delivers superior insulation, while the wine pourer and corkscrew accessories ensure you have the perfect pour for a great evening! Bursting with a collection of gourmet sweets and flavorful snacks, the Sunsational Shimmering Sweets and Snacks Gourmet Tower is an impressive gift for any occasion. Elegant packaging will have your recipient swooning over its beauty, while the treats hidden in each tier will provide bountiful snacking opportunities. Whether you’re a beer aficionado or just looking to liven up your next rendezvous, the Chalkboard Flight Crate Kit is a trendy gift for those who enjoy a refreshing beer. Creatively label each drink with the front panel chalkboard and simply wipe clean when ready for the next round! Wow your recipient with the Rustica Sweet & Savory Tower’s array of delicious treats carefully housed in two lovely refined yet rustic wooden boxes. The indulgent selection of sweet and savory choices will provide an abundance of tasty snacking options for continuous satisfaction. Designed for everyday use and special occasions, Bellagio Wine Glasses are the perfect complement to your favorite wine. Created to enhance each experience, you’ll find yourself reaching for these glassed time and time again, while enjoying the wonderful company around you. Now that we’ve whet your appetite for food gifts, consider when, what and where you can utilize this gift-giving and food trend. It is a good bet that no one will be disappointed in free food! Reach out to your Proforma representative today for more gourmet options or to place your food gift order.